Bird on a wire, light in a cage, Foyer lighting is all the rage. And Hinkley Foyer lighting leads the way with sleek designs, ephemeral shapes, candelabra lights and very detailed trim. 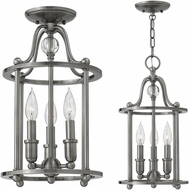 Gilded lights, bronze crackle, pewter and old bronze abound in this amazing array of foyer fixtures by Hinkley Lighting.